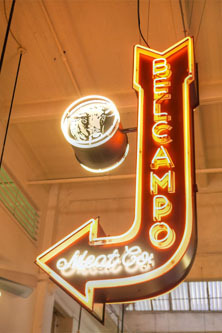 Continuing my exploration of Grand Central Market, my latest meal here brought me to Belcampo Meat Company, which opened on March 20th. 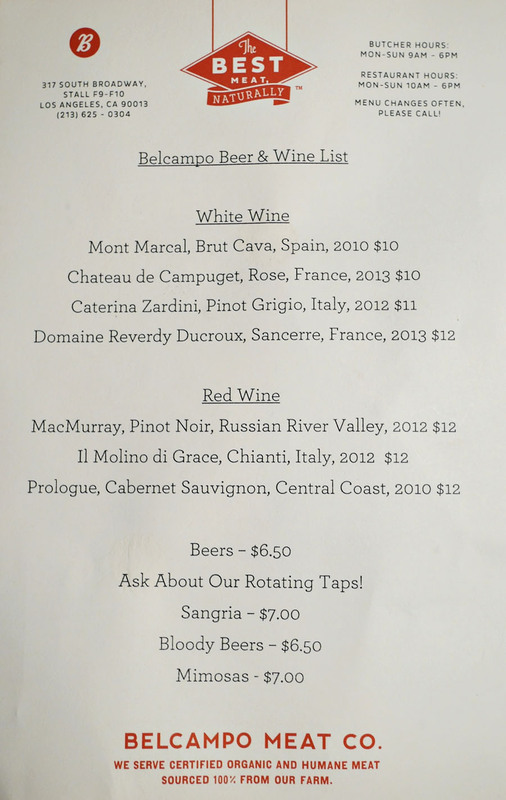 Belcampo's parent company is actually relatively new, and was founded in 2011 by Anya Fernald and Todd Robinson as an organic/humane/sustainable processing plant near Mount Shasta. 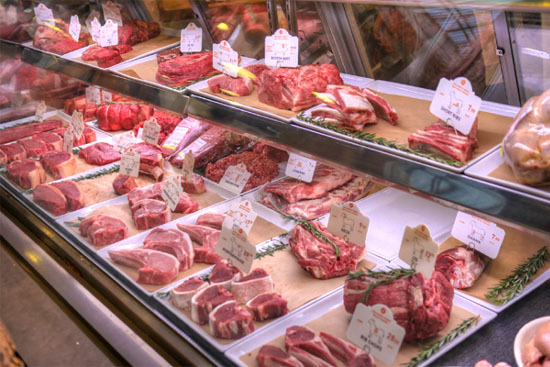 In 2012, the group expanded into butcher shops-slash-restaurants, becoming a vertically integrated operation, and the GCM outpost is one of five current locations (the others are Larkspur, Palo Alto, Santa Barbara, San Francisco). Running things here is Manager/Head Butcher Jered Standing, while kitchen duties are handled by Central Coast native Robbie Arnold-Starr and sous chef Brian Hoffman. 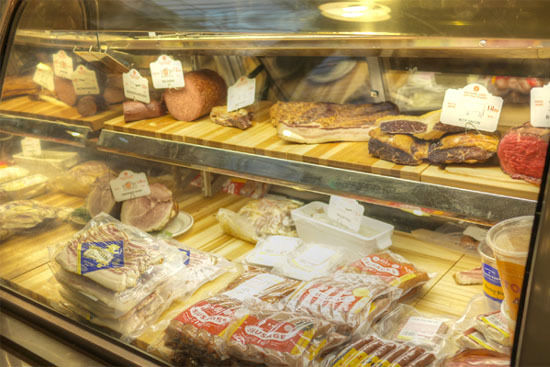 Belcampo runs a high-end butchery operation at GCM, with cases of meat and various cured/smoked/charcuterie products available for sale. We were here to eat, though. 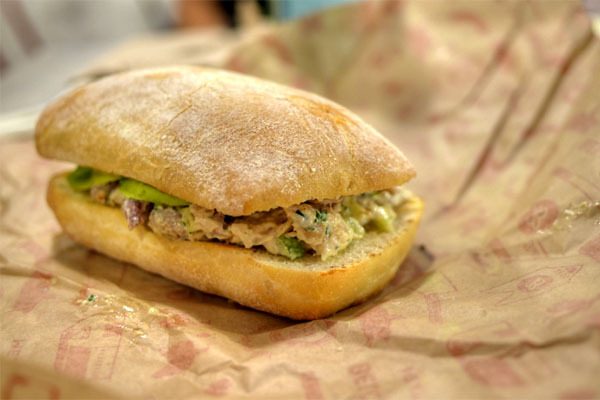 Belcampo's lunch menu features a selection of sandwiches and sides, though brunch and dinner are also served. 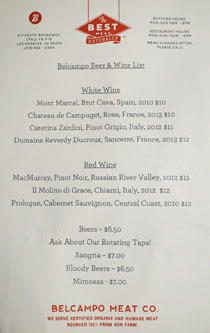 To drink, think a handful of beers on tap and a few wines. Click for larger versions. 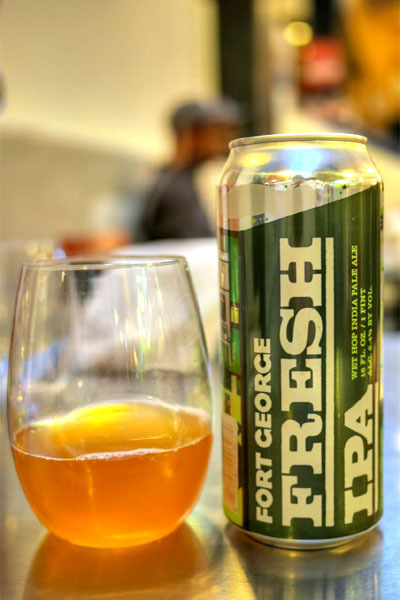 As usual, we brought our own booze and kicked things off with a can of the 2014 Fort George Brewery Fresh IPA, a limited edition wet-hopped IPA brewed in collaboration with Loftus Ranches. It was indeed fresh, with a piney, resinous quality both on the nose and the palate, joined by a touch of grapefruit and not much maltiness at all, the whole thing finishing on the bitter side. We had to start with Belcampo's signature item, a burger featuring wagyu-Angus chuck-sirloin-brisket, loosely packed, joined by Cheswick white cheddar, caramelized onions, and ketchup-aioli, all on a buttered BreadBar bun. It certainly wasn't pretty, but the flavor was there, a pure, focused beefiness that really spoke to the grass-feeding and dry-aging going on. 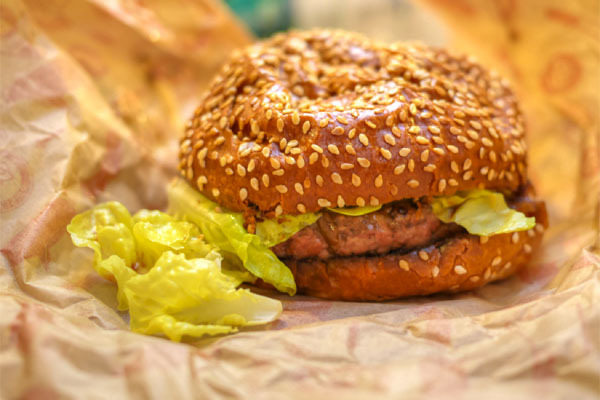 The richness of the patty melded nicely with the sweet onion and cheese, and I appreciated the lightness imparted by the lettuce here, too. Mouseover for a secondary photo. 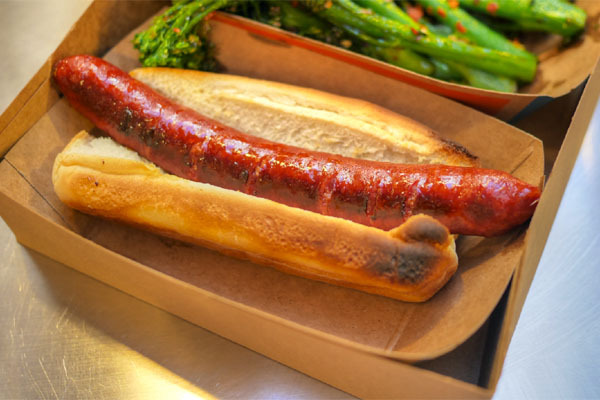 The hot dog was pretty much just a hot dog, albeit a tasty, well-textured example. Good with a dab of mustard, and I enjoyed the snap on the casing here as well. 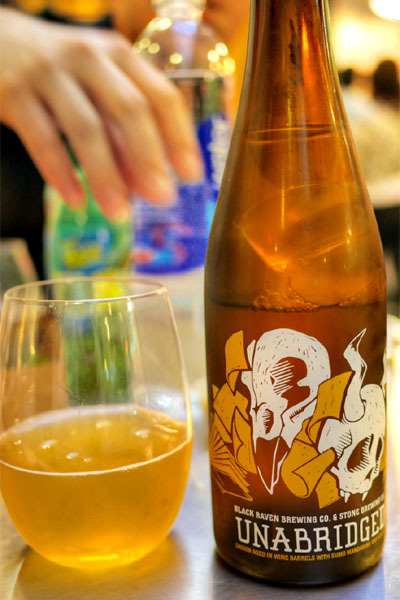 My next bottle was the 2014 Black Raven Brewing Unabridged, a saison with Sumo mandarins and toasted acacia chips aged five months in wine barrels, brewed in collaboration with Stone. 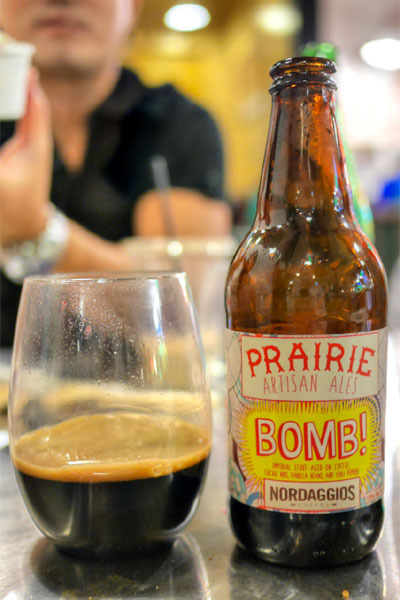 It was a unique beer, with lots of tart citrus joined by a focused bit of dry, earthy funk, everything underscored by a vinous quality and leading to a long, lasting finish. 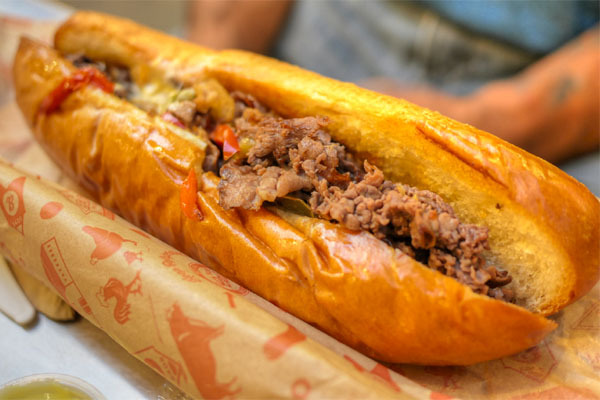 The Philly cheese steak was a favorite of mine, the goodness of the beef commingling beautifully with the homemade Whiz, all while peppers and onions added a bit of bite to the sandwich. 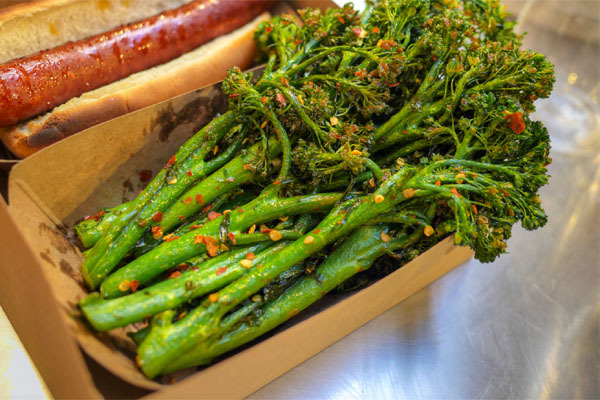 The broccolini was also a winner, arriving just crunchy enough and loaded with plenty of spice and citrus to offset the inherent bitterness of the vegetable. 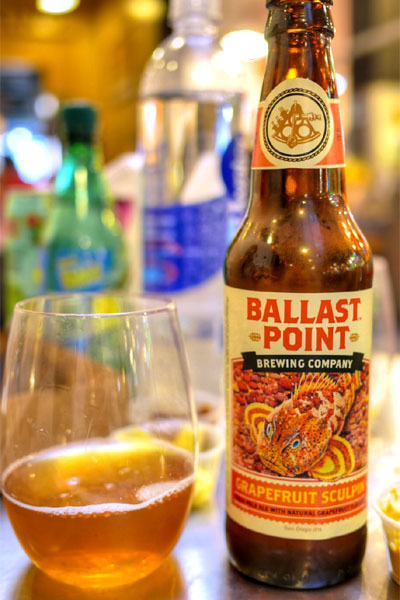 Going back to IPAs, we had here the 2014 Ballast Point Grapefruit Sculpin. Sculpin was one of the first IPAs that helped turn me on to the style, and this fruited variation arguably improves on the original, really augmenting the intrinsic tropical, citrus fruit notes in the beer. Summer-y and refreshing. I was also a fan of the lamb belly, which made good use of harissa to go along with the tender shards of meat here. 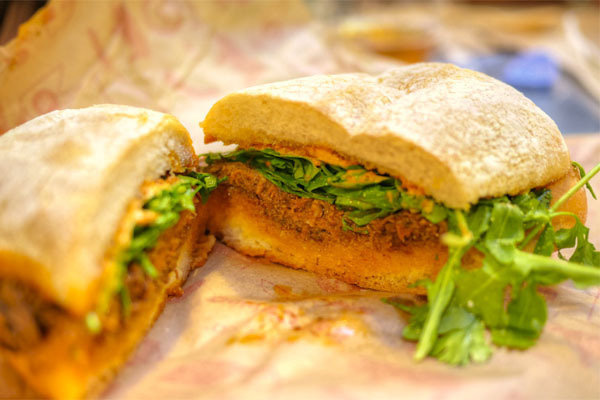 Great zippiness from the arugula-cilantro combo to boot. 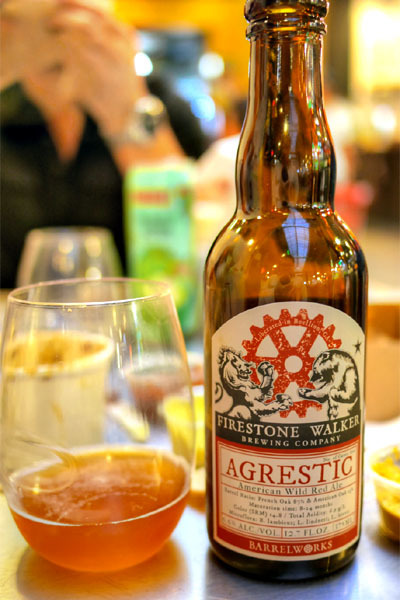 Moving to a sour now, the 2014 Firestone Walker Agrestic was another oak-aged, Barrelworks-only release from the brewery. Done in the wild red ale style, this was expectedly sour and acidic, with a persistent funkiness throughout joined by an oaky character and finishing dry and crisp. 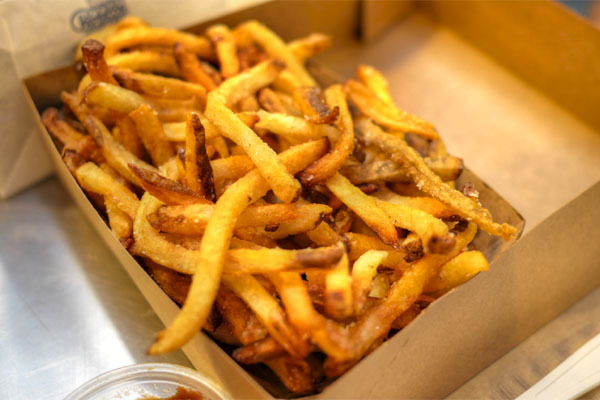 Fries were properly crisp, but not overly so, and went great with a dab of the housemade ketchup. My only concern was that they were a touch on the salty side. 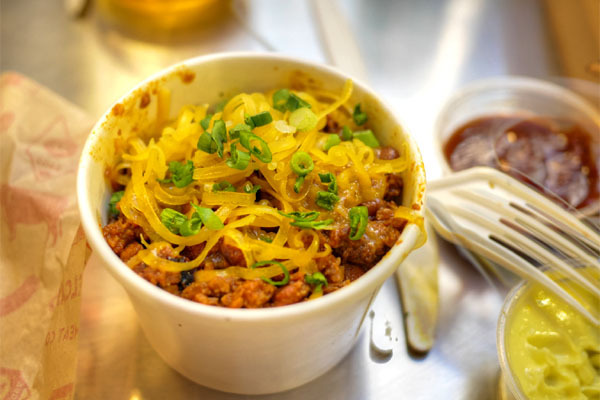 The chili really showed off the flavors of the beef and beans, but I wanted it "wetter," so that the flavors could meld a little more. 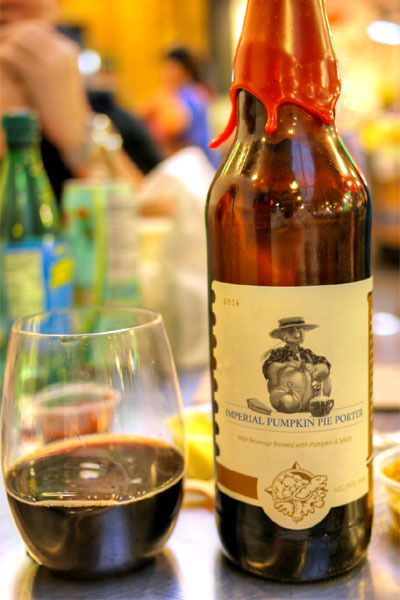 Next up was the limited-edition 2014 Terrapin Imperial Pumpkin Pie Porter, a pumpkin beer with cinnamon, ginger, allspice, and cloves that was apropos for the season. I got quite a bit of roast, coffee, and chocolate in the beer, and though the pumpkin and spices were there, I really wanted that aspect to be more apparent. The meatloaf arrived well-spiced and not overly dry as it often tends to be, with the provolone adding further richness to the meat. 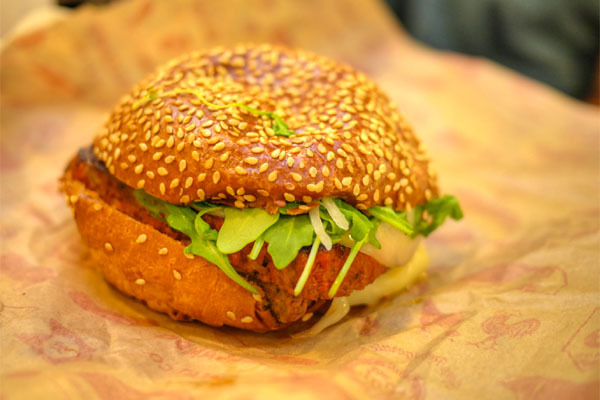 Nice use of the Sriracha and arugula to brighten things up here, too. Mouseover for a secondary photo. 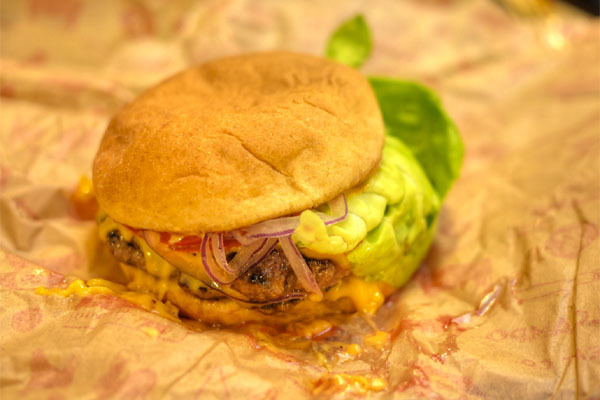 Belcampo's version of a fast food burger came out on the messy side, a combo of dual 3-ounce patties, American cheese, lettuce, onion, and tomato. It was tasty though, a classic pairing of meat-cheese-veg with a little more depth thanks to the use of grass-fed beef. Mouseover for a secondary photo. 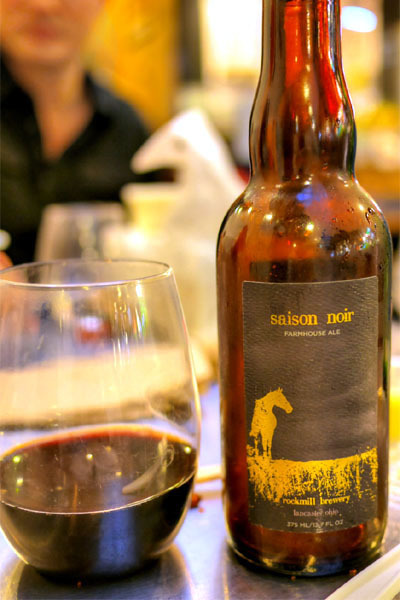 The 2014 Rockmill Brewery Saison Noir didn't quite sit well with me. There was a roasty, coffee-tinged flavor profile here, along with a bit of dark fruit going on, but not much saison-character at all. It just seemed a bit off. 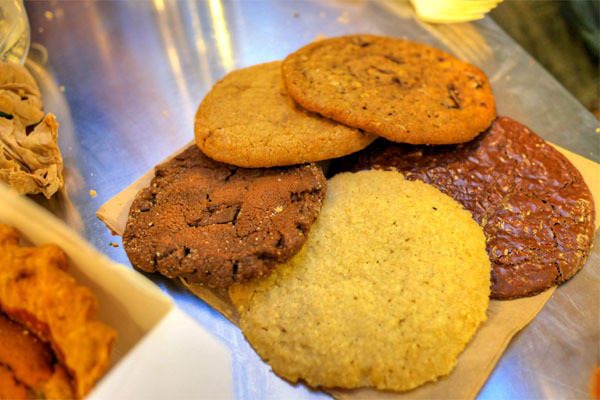 For a dessert interlude, one of my dining companions busted out some squash pie and assorted cookies from the newly-opened Gjusta in Venice (by the Gjelina folks). 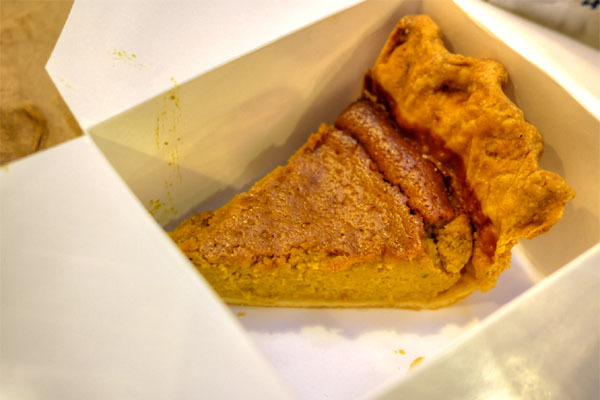 The actual pie was pretty tasty, though the cookies disappointed, veering thin, tough, dry, and bland for the most part. 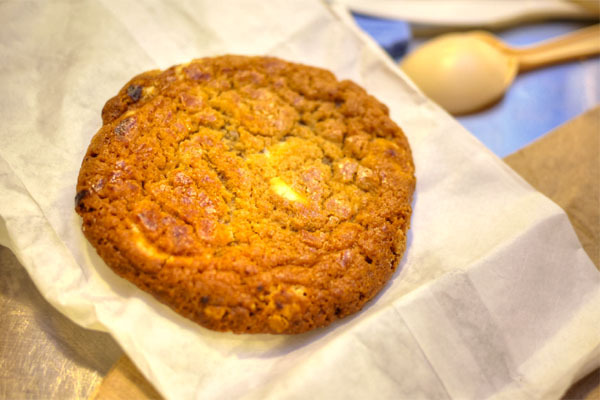 The Miso Butterscotch Cookie from Stumptown Coffee fared much better. 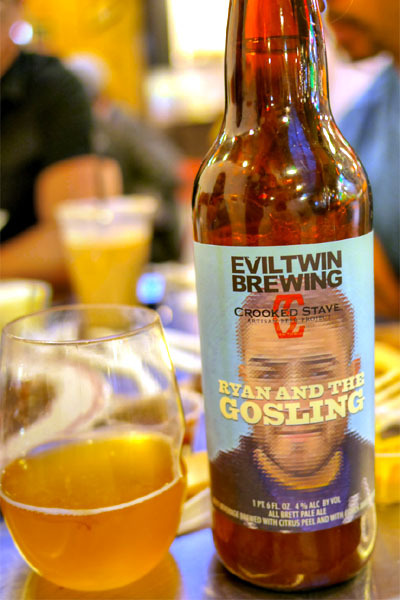 Next to drink was the 2014 Evil Twin / Crooked Stave Ryan And The Gosling, a Brett ale made with citrus peel and juice. The beer wasn't quite as dreamy as its namesake, but was enjoyable nonetheless, with a pronounced citric quality to go with the dry, spicy, yeasty slant of the brew. 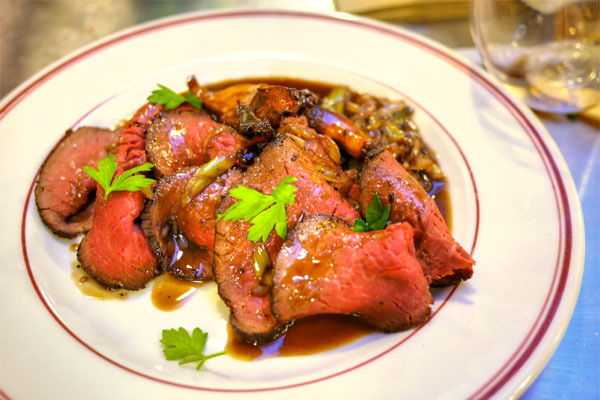 The Chef then sent out a special, a French cut of beef from the top of the hind leg called La Poire, served with chanterelles, leeks, parsley, fleur de sel, and jus de bouef. The meat was cooked over medium for tenderness, and was flavorful, its savoriness amped up by the mushrooms and jus while the greenery imparted a bit of levity to the dish. I would've liked more brightness, more acidity though to kick things up a notch. Our final savory brought out the chicken salad sandwich, a much more "chicken-y" presentation than you typically get, with a deeper, earthier sort of taste countered by the sweetness of the raisins while the veggies worked in lightening things. Mouseover for a secondary photo. 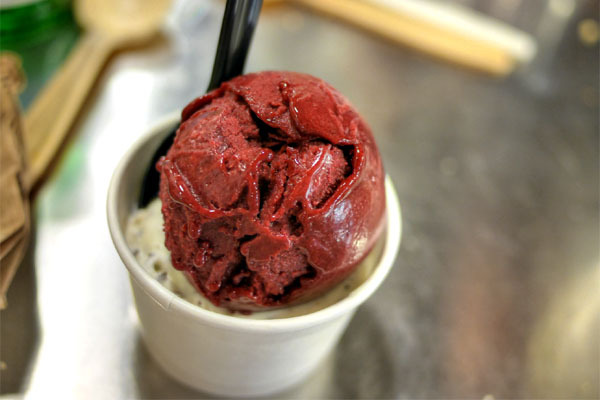 We then went over to McConnell's for ice cream, ordering up scoops of Blackberry & Bearss Lime Sorbet/Toasted Coconut Almond Chip and Mint Chip/Eureka Lemon & Marionberries. Yum. 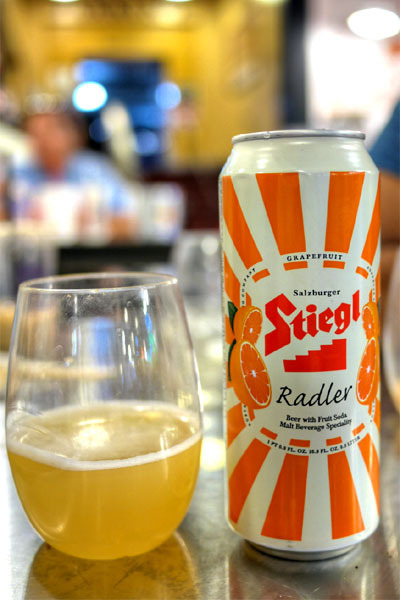 We couldn't resist mixing in some beer: the super refreshing Stiegl Radler Grapefruit with the sorbet, and the Prairie Bomb! with the Toasted Coconut Almond Chip (excellent) and Mint Chip (disconcerting). 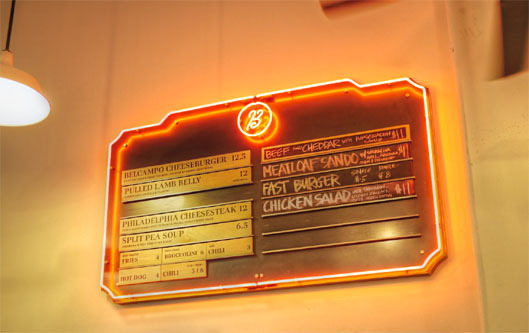 Belcampo's yet another compelling addition to the line-up at Grand Central Market, serving up some tasty meat-forward dishes while operating a legit butchery enterprise. As for what's next, they're slated to open a larger location in Santa Monica in the coming months, set in the old Dakota Lounge space and with cocktails from Julian Cox and Josh Goldman. 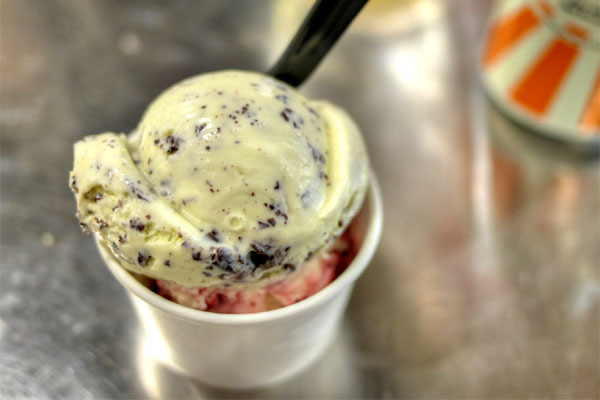 And if that wasn't enough, there's supposedly a third outpost in the works for next year at West 3rd Street and Laurel, the old address of a Baskin-Robbins. Beer from Salzburg. Bonus points. i buy their steaks semi-regularly. I like them, very different from anywhere else. I don't know any other producer trying to go for grass fed beef with the same level of marbling. It comes out to be a very interesting flavor of earthiness and richness. H.Peter: Are there any other good beers from Salzburg? Justin: Nothing too crazy this time though. Anon: Not all were excellent lol. Charlie: I like the sound of that. Quite often, grass fed veers to lean for me.